Record-breaking Harvey, followed by the largest hurricane ever seen in the Atlantic, with Hurricane Jose right behind. Add the West engulfed in fire, millions flooded out in Asia – who can keep up in a destabilized climate? We’re going to try this week on Radio Ecoshock. We start with critical new science from Italy about the incredible heat to come. Then our regular guest scientist Paul Beckwith paints the big picture missing in the media. It’s radio that tries hard, in trying times. New science shows killer heat waves will sweep the world as the globe warms. Are you ready for 55 degrees C, or 131 Fahrenheit? Nobody is. 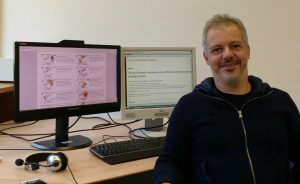 Our guest is Simone Russo, a geophysicist working at the Joint Research Centre of the European Commission, located in Ispra Varese, in Northern Italy. In my opinion, there are two important aspects to this interview, and this paper. #1. Some parts of the world (not all of it!) will experience apparent temperatures of 55 degrees C, or 131 Fahrenheit. That’s beyond the survival range of humans (without air-conditioning or something), and most mammals. Some plants will die at those temperatures, and hardly any plants will be able to grow in such heat. These extreme heat waves are most likely where humidity is also high at the same time of year when heat is prevalent. That’s the “apparent heat” (more about that in a minute). So the South Eastern United States, parts of India, and parts of China are most likely to see such killer heat waves, as this century progresses. How often depends upon how much more we raise the global mean temperature. Other parts of the world may also experience this, and some parts of the world definitely will not. #2. These scientists have worked out a way to measure the real heat impact (on humans). Simone tells us that is needed, because if we just use temperature only, we would miss events like the heat wave that hit Chicago in 1995, leaving hundreds dead. We need to include the humidity as well. That’s common knowledge, that “dry heat” is easier to take than humid heat. Some weather forecasts include a measure of the heat and humidity combined, perhaps calling it “the humidex” reading or something. But there’s another factor: how long has the heat continued? For several days? That adds more heat stress to mammals and needs to be considered, these scientists found. So Russo et al worked out a single number which reflects (a) the actual temperature, (b) the humidity and (c) the length of time it persists. That gives a number they call the Apparent Heat Wave Index (AHWI). It could be used by public health planners, other scientists, and weather forecasters on TV and radio. This number will show deadly heat wave events. A scientist on Radio Ecoshock a few years ago told us there is another factor adding to the death toll during heat waves. The first is whether it cools down at night, giving the body core a chance to re-set. That factor is not included in this study. How often will such extreme heat waves hit? That depends on when we hit two degrees C of global mean warming, and whether we go beyond that 2 degrees – toward 3 or 4 degrees warming by 2100. If the global community miraculously holds warming to 2 degrees C by 2100 – then we might get extreme heat waves in some parts of the world perhaps once in ten years. If we hit 4 degrees, then it’s bad, says Russo. Extreme heat might be as common as every two years, an expected part of the horrible new “normal”. The best solution, he says, is to prevent the world from warming that much, while we still can. Simone is a scientist is located at the ISPRA science community in Varese, Northern Italy (right on a gorgeous lake). The facility started out as a nuclear research base, but has since converted to all kinds of science. The staff consists of about 1,000 people. Simone’s work is funded by the Joint Research Centre of the European Commission. I won’t go into another long list of cities and countries that flooded just this summer. It’s world-wide. My first program of this fall season was about Hurricane Harvey and the floods in Houston, East Texas, and Louisiana. Now another giant hurricane threatens to land on the U.S. East Coast, named Irma. 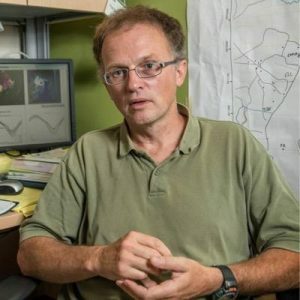 A couple of days before Irma arrived in the U.S., I called our regular Ecoshock correspondent, scientist Paul Beckwith at the University of Ottawa. Paul already posted You tube videos about Harvey and Irma, each getting tens of thousands of views. This is our conversation. I really liked Paul’s two videos on Hurricane Harvey (Part One here). He explains exactly how to use mapping information previously only available to big institutes and governments. At web sites like earth.nullschool.net we can see what is really happening on planet Earth, in real time. Well known climate bloggers like Robert Scribbler use these tools too. Paul is arming citizen scientists like you – with tools for all. He is essentially teaching a rolling climate science course to thousands and thousands of people via You tube. Strange records are popping up all over: The biggest rain dump in U.S. history; the largest fire in Los Angeles history. Maybe one of the biggest hurricanes crossing the Atlantic. Extreme rains all over the world. When I interviewed climate scientists ten years ago, all this was expected by 2100, or maybe 2040 at the earliest. Why is climate disruption coming so much sooner than expected? I think we got misled by three major factors: the slow pace of science and scientific publishing; the dependence of the Intergovernmental Panel on consensus approval, even from oil producing countries like Saudi Arabia or the United States; and finally waves of oil money buying the media and the electoral process. All of the authorities underestimated the speed of climate change. For example, even the best Arctic experts were jaw-dropping shocked when the polar sea ice melted back so far in the late summer of 2007. That kind of melt wasn’t expected until maybe 2050, according to the models. That’s a problem Paul points out: we’ve been too dependent on climate models, and not watching events on the ground (or the sea) closely enough. I also recall having at least one scientist guest explaining that climate sensitivity is much greater than previously thought. That speeds things up, and provides more extreme events, like the fires and record hurricanes we’ve just witnessed. When I interviewed the climate-aware meteorologist Bob Henson about the Houston flooding, I wondered out loud if extreme rainfall events, and the huge costs of trying to recover so-called “normal life”, might eat away at the model of mega-cities around the world. He didn’t think so, but Paul agrees and explains further his vision, from the science he’s worked through. IS THIS THE END OF THE FLORIDA REAL ESTATE PONZI SCHEME? Then we have the coming crash of coastal real-estate due to rising seas. The whole real estate market is based on sky-high values along the ocean. Sea-side homes and entire major cities will eventually have to give up to encroachment by the ocean. That may be a decade or two away, but I think even the certain knowledge this is coming will destabilize real estate, and maybe the economy, even before it happens. Am I being too extreme? Not really, it’s becoming common knowledge that the Florida real estate ponzi scheme will crash. Maybe that’s what Florida Governor Republican Rick Scott is trying to keep secret, when he forbids any government agency from using the words “climate change”! Meanwhile, it’s hard to find a government that isn’t promising more “infrastructure” – by which they usually mean more highways and bridges for cars and trucks burning fossil fuels. There isn’t much vision for a transition away from all that. Do we have to crash through years of climate emergencies first? WILL CLIMATE CHANGE END THE EMPIRE OF THE WEST? Great Britain “won” the First World War at great cost, and after winning the Second World War was financially broken and without its former empire. I predict the same thing will happen to the United States, as it appoints climate deniers to oversee science and energy. The coming climate wars will include floods, fires, droughts, and unstable food prices that could eventually lead to a series of financial crashes, and maybe serious system breakdown. America would lose it’s global military bases and leadership. A couple of European countries, including Great Britain, have at least announced an end-date for vehicles burning gas or diesel fuel. But that promised time is at least two decades away. I also wonder about the public state of mind. It’s hard to evacuate because of fires; to keep your kids indoors because the air isn’t safe to breath; to go live in a convention centre and try to sleep on a cot while your home is flooded. Even seeing this on TV, and thinking “I could be next” – the herd is getting nervous. Climate activists think the fires and floods will empower a movement. I wonder if a general climate demoralization might just stall or discourage the real action we need. Do you worry about the psychology of living through a never-ending climate crisis? Musician David Rovics says he’s detecting a kind of climate shame in the people he knows around Portland. The shame that we let the climate go so far out of normal, before we even talk about it. Personally, I haven’t seen much remorse beyond a few people who follow outliers like Paul Beckwith or Alex Smith. Besides raw heat, there are also built-in red-lines when it comes to the smaller life that supports us. Scientists are already debating if coral will survive, and coral is the nursery of the sea. What about plankton, bacteria and the whole host of tiny life what we depend on? There is new science out saying even parasites are starting to experience mass extinction. Really the science of climate change leads us into a debate of whether an awful time of trial will arrive in the long-term, when most of us have passed on, or in the short-term, like in next few years. Are you a long-term “Hell is coming” person, or a short-term “it’s way past time to panic” person? Find all of Paul Beckwith’s videos here. Track his web site here, at paulbeckwith.net. During the interview, Paul tells us that due to changes in classes, he has no teaching appointment this semester. That means to continue making his popular and useful You tube videos, Paul needs your donations. He has no big institution or major funder. Everyday people keep him going. Be sure and help Paul if you can – he’s been a popular guest on Radio Ecoshock many times, and I can’t afford to pay him either. He just gives and gives to us all, as the climate crisis gets worse. We have to keep people like that going. Thanks Paul! The downer song at the end of this show is E-Race by Afrizen, as suggested by long-time listener Robin Datta. Join me next week for more breaking climate science explained by the scientists themselves – plus a well-known alternative voice with a better way out. I’m Alex Smith, thank you for listening, and caring about our world.